Here is a new video from Daniel and Dane DeHaan talking with Josh Horowitz on MTV's After Hours where they talk about their movie idea (called Snowy River). Here is a video via Josh Horowitz' instagram. Help them by donating to their Kickstarter campaign... (which actually doesn't exist). "Happy/Sad/Confused. With Daniel Radcliffe & Dane DeHaan. 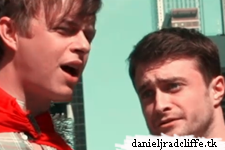 #danielradcliffe #danedehaan #happysadconfused"